As our family contemplated how to spend my 17-year-old son’s high school spring break, my son lobbied hard to make it a motorcycle camping trip. Last summer, I picked up a 1995 Honda 750 Magna for the sole purpose of using it to teach my two sons to ride properly. Having ridden on the back of my motorcycles since the age of 4, I knew both sons would eventually take to riding, so my wife and I agreed it would be best for me to try to instill safety and good riding skills before they ran off on their own and bought a motorcycle. Since spring break for my son’s school was in mid-March, we knew the trip would have to be somewhere south. We decided on Gulf Shores, Alabama, where my wife and I have enjoyed visiting in the past. So, we hooked up our Time Out tent camper to our Gold Wing and my son loaded a T-bags piece of luggage onto the Magna. And we were ready to roll! On our first day we rode from our home north of Knoxville, Tennessee, to Birmingham, Alabama. We arrived early enough to enjoy a several hour visit at Barber Vintage Motorsports Museum. It was great to see all the outstanding examples of motorcycle history. We particularly enjoyed looking for a Honda CB750 since my two sons and I restored a 1971 CB750 with a sidecar several years ago, which is now in the hands of a French collector. I also enjoyed checking out the 1975 Honda Gold Wing since my bike is a 40th Anniversary Edition Gold Wing. It is truly amazing to see how motorcycle touring has evolved in just one lifetime. Our second day was spent riding to Gulf State Park where we set up our basecamp for the next several days. The state park is a well-maintained campground with clean amenities. The only drawback was the constant breeze that made cooking and campfires near impossible. But that is sort of normal for any coastline site. 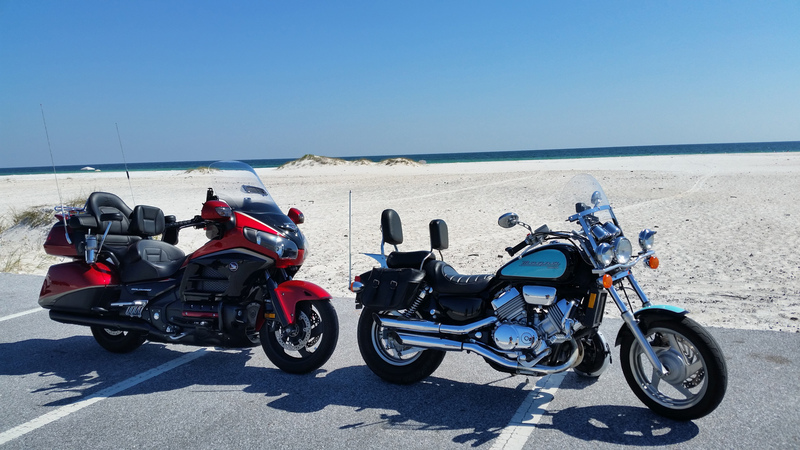 On our third day, we rode east along the coast into Florida. We made a stop at the National Naval Aviation Museum located at the Pensacola Naval Airbase (see photos, right). This is an incredible museum with a vast display of aviation history and admission is free. After the air museum, we enjoyed riding along the Gulf coastline on a cloudless, sun-filled day. The phrase, “It doesn’t get any better than this,” would be fitting for today. For dinner that evening, we drove a few miles to Foley, Alabama, where we had dinner at Lambert’s Cafe, “Home of the Throwed Rolls.” Anyone visiting the Gulf needs to make this a dinner stop one evening. Bring an appetite! It is truly a unique dining experience with pass-around side dishes and some dude throwing fresh hot rolls at you. Their website is www.throwedrolls.com. Day four our plans were to ride west along the coast with a trip on the Mobile Bay Ferry. My wife and I did that a few years ago and knew my son would enjoy seeing the oil rigs and, maybe, dolphins up close. However, when we got to the ferry we were advised it had broken down and had to return to the opposite shore. With no idea when it might return to service, we had no choice but to backtrack and take the long way around Mobile, Alabama, in order to ride the coastline near Biloxi and Gulf Port, Mississippi. For our fifth day, it was calling for heavy storms so my son and I took the day to fish from the Gulf State Park fishing pier. This is the second longest fishing pier in Alabama and quite impressive. Although we really did not catch anything, we had a great day fishing and hanging out with the pelicans. Later that day, heavy storms moved in. Heavy winds collapsed our add-a-room and my son’s tent got very wet. But nothing was damaged and we dried out by bedtime and had a nice quiet night. On day six, we began our journey back home. We decided to ride to Natchez, Mississippi, where we would ride the Natchez Trace Parkway to Nashville before heading home to east Tennessee. After a very pleasant day of riding, we arrived at Natchez State Park where we set up camp. Now this is one very nice campground – very clean, quiet, with level pads and nice grill, tables and fire ring – all for a whopping $18 a night! If I had more time, I could have spent another night here and explored the Natchez area more. Anyway … I give two thumbs up for Natchez State Park campground. Day seven we began our trek up the Natchez Trace Parkway – a very scenic, somewhat slow ride along gentle curves on an excellent road surface. Our first stop was at an early 1800s inn, which served those who originally walked the trace. Our next stop was at Cypress Swamps. This was something we simply do not see where we live. We even got to see some gators in the wild. We then decided to exit for gasoline. About halfway around the exit ramp I heard the nauseating sound of metal meeting asphalt. I looked in my mirror to see my son and the Magna flopping to the left side. I pulled over and rushed to him and had him calm down so I could make an evaluation of his condition. He was upset that he may have scratched the bike, but I assured him that did not matter one bit. After a few minutes it was clear he did not hit very hard. The bike had no real damage other than a few adjustments. The Kevlar jeans, padded jacket and helmet all did their jobs. After he calmed down and we could talk about things, it appeared that he felt he was going too fast and touched the front brakes too hard while leaned over. I think the best lesson he will take away from this is that proper riding gear really can make a difference. I probably lost 10 years off my life during those few seconds. I assured my son he did not have to continue riding. I explained that I could get a U-Haul and head on home. He would not hear of it and assured me this was not changing his desire to ride. When I was certain bike and rider were OK after the accident, we rode a short distance where we sat down for an extended break. This was both to let my son relax more, but also to keep a close eye on him should any signs of unseen injury become apparent. After more than an hour, I was sure he was in fact OK to continue. So we proceeded to our next planned stop. The one advantage to running behind schedule due to the minor accident was we happened to reach where the Natchez Trace Parkway crosses the Tennessee River at sunset. Simply beautiful and a lesson to my son … no matter how hurried you are, some things are worth taking the time to stop for. Now, one might think this would be enough adversity for one day but, oh, no. We finally arrived at our planned camping stop at the Hohenwald Natchez Trace KOA and it was a total disaster. All of the roads were so bad I could hardly keep my bike upright. I commented at one point that the roads literally appeared to have been carpet-bombed. I assure you that is not an exaggeration. We rode around this campground for 20 minutes in search of any site I could put my Gold Wing on its side stand long enough to disconnect the camper. There simply was nothing. Folks, avoid this campground! So using my GPS and cellphone I found an Americas Best Value motel, 15 miles away in Lawrenceville, Tennessee. Already after dark, I decided not to try to locate another campground. We were pleasantly surprised to find this was one of the nicer motels in this price range we have been to in some time. After a much needed good night’s sleep, we rode the last leg back to our home in east Tennessee. It was a trip I believe my son will remember for some time. It also taught him many lessons. One, that proper riding gear really does have value. If he ever chooses to ride without it, I rest easy knowing it is not because he doesn’t understand its worth. The second lesson he learned is no matter how well one plans a journey, things will happen that require you to adjust quickly and to make the best of things. Posted 05/21/2018 by staff & filed under Road Trips. Wonder if that boat ever runs? I was going from New Orleans over the Florida and wanted to hug the shore as close as I could. Turbo was out, no boat running. Turn around back track.